Piriform CCleaner is a free system tool that removes unnecessary or redundant files, fixes errors and optimizes software to speed up your PC and protect your privacy. It's one of the most popular PC cleanup tools around, and for good reason. Simply select a drive to scan it, and CCleaner will show you how much space you can save, and which tweaks it can make. Choose what to remove or fix, and the software will do the rest. 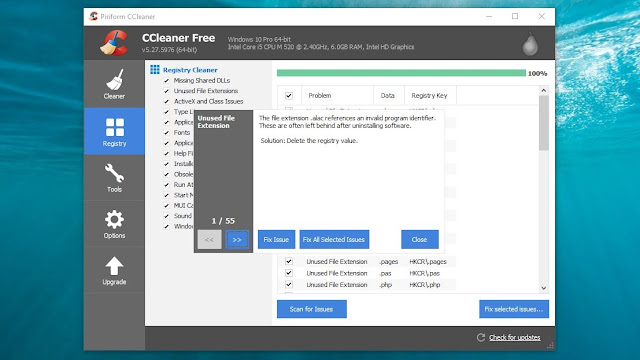 CCleaner also boasts a registry cleaner to remove unused entries and correct errors that could slow down your PC, plus a secure file shredder for erasing confidential information. In theory, everything CCleaner does could be accomplished using Windows' own optimization tools, the Task Manager and your browser settings, but that would take time that many of us simply don't have to spare. CCleaner's clear, well designed interface makes it incredibly simple to keep on top of the housekeeping it's easy to ignore (even though you know you shouldn't). A registry cleaner, which can remove unused registry entries, file extensions, ActiveX controls, ClassIDs, progIDs, uninstallers, shared DLLs, fonts, help files, application paths, icons, and invalid shortcuts. This is particularly helpful if you're having trouble installing a new version of a previously installed program. A browser cleaner, which can remove temporary internet files, history, cookies, download history and form history, plus index.dat files from Internet Explorer. This is a convenient way to purge tracking cookies. A Windows cleaner that clears the Recycle Bin, recent documents, temporary files, log files, clipboard, DNS cache, error reporting, memory dumps and jump lists. This is best used carefully – restoring accidentally deleted files can be a nightmare, even with tools like Piriform's own Recuva. A third-party program cleaner, which deals with non-system apps like Windows Media Player, eMule, Google Toolbar, Microsoft Office, Nero, Adobe Acrobat and WinRAR. Each element is explained clearly and you can deselect anything you don't want to be cleaned up so you don't accidentally remove anything that you might later need. For example, CCleaner can erase usernames and passwords saved by your web browser, but only if you explicitly tell it to. These are all very handy to have, though the tool likely to have the greatest impact on system speed is the startup program manager, which lets you pick and choose which apps start at the same time as Windows. How often you run CCleaner is a matter of personal choice; its settings give you the option to run it every time your PC starts, but you may prefer to run it manually from time to time instead for faster boot times. The free edition of CCleaner doesn't include automatic updates, so it's worth clicking 'Check for updates' in the bottom right periodically.